What is Redington Sonic Pro Wader Best For? The water looks inviting and you’re ready to wade right in. Part of being an angler is getting out into nature, up to the belly and touching the world around you. Part of being a true fisher is having a pair of waders that keep you confident enough that you know you’ll stay dry. Though skinny dipping in the cold lake may seem like a fantasy, in reality, it leads to a head cold and a runny nose! Redington Sonic Pro Waders are the top of the top when it comes to waders. Made by the highly recommended brand Redington, these waders come as a stocking foot, chest wader set. Fashioned from fabric designed for breathability, these waders ensure ventilation, with watertight edges to keep you dry. One of the best features is the TIZIP waterproof zipper front allowing easy access as well as the added confidence in its waterproof capabilities. These state-of-the-art waders are ideal for keen anglers and have just come on the market in the last year as the newest product from Redington’s wader range. Here is our guide to what we think about these glorious waders and why we see them as a great fit for any fisher. These have a great fit. The company has redesigned them so that they have a range of sizes to fit all men and women. The versatile sizing enables you to feel more comfortable while remaining dry as the waders cling more fluidly to your body mass. The neoprene booties are designed to keep you dry, while also remaining tough. Rough bottoms of lakes and streams can cause microabrasions over time which damage the material. These waders feature very thick neoprene on the booties, giving them a 3.5mm upper casing and a 4mm base. The extra PK nylon in the base toughens the material against abrasions even further. The seam tape is also neoprene to prevent water from entering from the joining material. The fit has also been redesigned for better flexibility and a more snug fit. Not only do these waders have more pockets than comparable models, but the fleece lining is engineered to keep your hands warm. Deep and strong, the comfy pockets can hold a lot of gear while keeping your fingers from freezing. The waders also include TPU pockets that are water resistant. This enables you to keep some of your possessions in dry pockets. The metal hardware on the waders is made from anti-corrosive metals to prevent the water, salt, and air from corroding the parts. This keeps the fastenings strong and durable. Moreover, the seams are stretch-woven, allowing the pockets to have some give and preventing them from tearing or becoming baggy over time. The seams are also tightly sewn to prevent them from picking apart. This unique feature is a big draw as the waders can be unzipped at the front for easy access when nature calls, while also providing a simpler way to get in and out of the waterproof suit. Amazingly, the zippers themselves employ a waterproof technology which keeps them watertight when zipped to the top. The chest pocket doubles up as an area for anglers to store their tools and fishing gadgets for quick access. The integrated tool docking station allows you to store nippers, fishing pliers and a few other bits and bobs. Equally, there is a wading belt included that gives you space to store more fishing tools and additional fly boxes. This belt is stretchy for better fitting and attaches through three loops for security. The first thing to ask yourself when reviewing waders is how useful they’re going to be. As a full body suit, they give great coverage and the waterproofing is of high quality and very durable. The suspender part of the suit is surprisingly soft, despite being tough. It can be resized for various body shapes, allowing you to adjust it for a comfortable fit. This makes them highly functional. Moreover, the extra tool deck, wading belt, and loops enable you to carry tools, extending the suit’s versatility and functionality. The pockets work as both as storage space and hand warmers, and a few of the pockets even work as extra waterproof storage. These waders are like a storage container. There seem to be more pockets, nooks, and crannies than a grandmother’s purse. The pockets themselves not only allow you to securely store tools and tackle boxes, but they are also fleece-lined for extra comfort. The loops allow you to clip on extra bits and bobs, while the front chest pocket serves as a handy tool deck for you to reach your gear easily. This ingenious storage system enables quick access and reduces the likelihood of losing your tools or having them fall overboard. We really dig the style of these waders. This is a strange thing to say especially considering waders are notoriously ugly waterproof sacks. However, in this case, Redington seems to have reworked the entire concept of waders to provide a chic-looking suit that is both waterproof and well-cut. A nice surprise in the angling world! These waders are made from solid materials. Designed with everything in mind, from top to toe, these waders include the toughest and most durable fabrics to do the job. The booties, made from 4mm neoprene, are strengthened with special nylon material to help reduce abrasions. The tough, nylon materials are ‘ultra-sonic welded’ together to stop any water from getting into the seams. This technology lasts a long time, keeping the waterproofing intact. 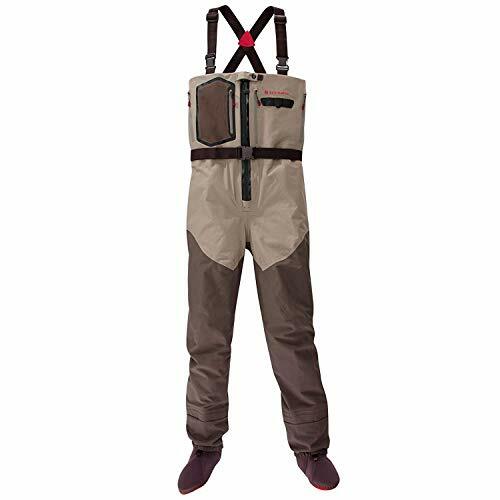 All the metal components found on these waders are highly durable, rust-proof, and designed to be resistant to the various corrosive materials out on the water. These last a long time and enable you to adjust the sizing of your waders for a better fit. The material of the waders themselves is remarkably breathable considering it is watertight. Users have complimented the comfort felt throughout long humid days wearing these waders. The zipper design at the front is revolutionary. When using these waders, you can’t help but be shocked that more wader designs have not used this waterproofing zipper technology before. The access when you’re desperate for a bathroom really makes a difference - especially if you’ve had a few cold cans with the boys! It’s also nice to get your waders off quickly when they’re wet and the day is getting cold. The main negative aspect that users have complained about is the wading belt. While it does prove useful, the material seems a little flimsy in comparison to the rest. While it isn’t all that noticeable as a negative, over time the wading belt tends to be subject to wear and tear quickly and more obviously than the rest of the waders. You will notice that the stretch starts to go as the elastic wilts and the loops appear a little saggy. This is a little disappointing but doesn’t really have a great deal of impact. For people with a long inseam, you may struggle with the fit a little. While they do offer long sizes, they are very long, which may give you too much extra material to stuff in your boot. While this doesn’t affect how water-resistant they are, it’s not that comfy. Aside from these little niggles, the overwhelming feedback from reviews is that these waders are incredible. There are very few negatives to report, in fact! The Redington Sonic Pro Waders are a great choice for all anglers, from the casual angler looking to keep his legs dry, all the way up to the professional fisher. This model is for men but the Redington range also provides a set of waders comparable to these for women. The high specification of these waders makes them a little over-the-top for less keen anglers, as they have many pockets, loops, and belt hooks for tools that amateur anglers are less likely to have. One thing about them that really stands out is their fashionable design. Typically waders are as ugly as their name sounds. However, these waders have been designed to shape the body a little more flatteringly, while also featuring a chic anthracite gray color and black accents. In the least crude way possible, for people who sweat a lot, these are a great choice. The four-layer material is engineered to be wonderfully breathable. This prevents the material from staining from sweat, while also allowing your skin to perspire without building up humidity inside your suit! The bottom line is that these are the best. Stylish, comfortable, breathable, versatile, and functional, these waders really have it all. While you may not think that you need to upgrade your waders, this set is like a walking waterproof toolbox. Designed for storage, the pockets are deep, plentiful, and fleece-lined for the colder weathers. Adjustable in size, these generally have a great fit, but watch out if you have a long in-seam but shorter legs. While the belt could do with some work, the overall verdict is highly positive. If you want waders that last for a long time, keep you warm and ventilated, and provide you with a warm, waterproof experience, the Redington Sonic Pro Waders are for you. A tip for buyers looking to purchase these amazing waders, if you’re looking for a women’s pair, the brand also designs a set of waders for females. Slightly more petite in size, they’re engineered to curve with a woman’s figure and provide the same snugness and waterproof capabilities of the male pair. For younger boys and teenagers, some users say that the female waders are a better fit. Remember the waterproof zippers! You’ll be overjoyed when you realize how much easier it makes life in times of desperate need and soggy, cold clothes!